In another of my series of Droid articles I wanted to share a recent discovery and address some rumors of a secret silent Droid update. When I first started to use the Droid 5 MP camera I was a little disappointed in the quality. Thankfully, a bug in the camera was confirmed and Motorola quietly acknowledged a fix was coming in a future update. This week a number of people noticed a sudden improvement in the Droid autofocus feature. An explanation came in the form of a comment on Engaget from purported Google Engineer Dan Morrill. The autofocus problem was due to timestamp rounding error and was fixed automatically once the date has changed. While I question everything, as a programmer I know anything is possible. I’m told a real service update will be provided before the next date cycle screws up the autofocus again. It will be an official update and not a secret silent one. I’m a skeptical person so I decided it was important to compare photos I took earlier this month with one take today. Taken today November 18th. The lighting change is unrelated to the autofocus changes but the detail is pretty obvious. Nice! Now, just to confirm the theory, I was able to set the date back on my Droid and take the following photo under similar light conditions. Thanks to Tech Crunch for bringing this information to my attention. Having better coverage is huge. I love my iTouch and my two year Verizon contract just expired. It would have been natural for me to go for an iPhone. My decision to get a Droid instead of an iPhone was based completely on my satisfaction with the Verizon network and stories of dropped signals from my friends using AT&T. Even without the stories the 3G maps don’t lie. The folks at Verizon know this and are going to take full advantage during this Christmas season with commercials like the following. Instead of writing a full length review of the Droid I’ve chosen to create day by day logs of my Droid experience. I expect by focusing on the stupid things I do it will be helpful to others. I’ve already had some useful comments posted on my Day One; First Impressions that corrected my beginner ignorance. I still haven’t totally figured out the Droid interface but I’m getting there. Today I wanted to see what applications I could find. I mentioned yesterday that my first downloads were Facebook and a Twitter app called TwitWalk. Thank you to Brian and John for pointing me to a different application called Tridroid. It’s free with a Pro version for $3.99. The text isn’t as large as TwitWalk but the Droid screen is so crisp I’m able to deal with it. Eventually I found there was an option in Twidroid to make the font larger so I’m very happy. Now they need an update for Facebook like we recently had on the iPhone. Adding applications to my Droid home screen wasn’t obvious. I could “LongTouch” an application to add it to my center home page screen but once it was full that user experience failed. As I write this I just watched a segment on TV about the Droid and noticed I could press one of my alternate home screens to add applications and widgets. Thanks you NBC. I realize they can’t make everything just like the iPhone but this was confusing. My next challenge is to figure out how to remove apps or widgets from my home screens. I can’t figure it out and now my home page is full. After searching online for help I discovered if you press an icon long enough the tab at the bottom turns into a trash can. Just needed to drag my app there. So the LongTough or LongClick is kinda like the right-click on Windows. It’s not obvious to everyone but is very powerful. One of the big deals about the Android OS is you can multi-task. I would be more impressed if I knew how to switch between applications without always having to go to the home page and re-open it. My friend Brian did point out that what looked like multiple open applications along the top I reported yesterday were actually notifications. I finally realized that anytime I get new Tweets and new messages on Facebook I get a little notification at top so my notification panel is pretty much always full and making noises. Once I figured out how to pull down the Notification panel menu I also found a way to switch back to open applications. Oddly enough, most applications don’t have a simple Exit or Close so one of the first applications I was told to get was Advanced Task Killer. I was surprised when I ran this and realized all my apps were still open. I killed them and voila’ all my notifications were gone. My first disappointment came looking for an application to view my home Slingbox. This is one of the applications I used on my iTouch all the time. There are some conflicting opinions online if an Android version of Slingbox will be available. My sources say it doesn’t look good. I was reluctant about downloading WeatherBug. Years ago they were one of the folks connected to the adware scum bags at Gator. I never thought I’d use WeatherBug again but I can’t deny this is a first class app. It’s still ad supported but I’m guessing this time I can remove it if I want. Just one very cool app. Just go outside and it will let you know all about the constellations in your night sky based on your GPS location. I’m anxious to see if it will download and include special events like when the space station is visible. This is another one of a kind, just for fun application. If you really want the people of Walmart to stop and take photos of you just go around the store reading barcodes with your Droid. It really works. One of my favorite features is hidden away under Settings –> About phone –> Battery Use. This screen provides more information than any other device including any PC I have ever used. Not only does it tell you how much power the phone and display are using, it tells you how much power is being used by individual applications that use hardware features. Stay tuned for Day Three. I think I’m going to work on getting my calendar and contacts updated. I’ve tried them all and I’m still not sure how we classify the new Motorola Droid. We’ve called them plenty of names; SmartPhone, Personal Digital Assitant, Pocket-PC, AppPhone but there isn’t a generic term yet for a iPhone Wannabe Device(IWD). Of all the hand-held digital devices, I’m pretty excited about the Droid. I’ve been an iTouch user for over a year but it’s not a phone. I’ve used a Verizon MiFi for internet access so I can use the apps which are actually more valuable to me than a phone. I refused to switch to an iPhone because AT&T 3G service in our area stinks. The Droid may finally provide almost everything I needed in a single hand-held device. If you’re looking for a full review of the Droid this isn’t one of them. There are hundreds of them online that review specs and typical review topics. This is as the title says Day One and I’ll tell you what I like along with all stupid things I still haven’t figured out. Watch for Day Two through Four and more as I explore more this week and learn how to unleash the full potential of the Droid. Not all Droids have the physical keyboard which is a little confusing. I have the Motorola Droid but Verizon is also selling the HTC Droid Eris which only has a virtual keyboard and uses an older version of the Android operating system. I thought one of the things I’d really love is having a physical slide out keyboard. So far (it’s only day one) I still like using the virtual keyboard. When I did use the physical keyboard weird screens would pop up because I may have been hitting shortcut keys. Keep in mind I’ve been using an iTouch and I don’t have any experience using a Blackberry type device. As far as virtual keyboard goes I like it even better than my iTouch. The Droid has a much better predictive dictionary so I don’t have to touch as many characters. Apple make have a million applications but just so many you really need. It took me a little while before I realized I needed to open the “Market” icon if I wanted the App Store. For me, the first apps I downloaded were Facebook and a Twitter client called “Twitwalk”. Facebook is barely usable and doesn’t come close to the one of the iPhone. Twitwalk is pretty plain but usable. I picked TwitWalk because it has the most stars but there are many others. I’ll write about other applications as I learn more. The weirdest thing I’ve experienced is on the top of the screen. It appears that I’m running multiple copies of applications. I remember someone on Twitter saying they had to download a program to close apps but I suspect this is user error. There is a Manage Applications selection under Settings but it doesn’t seem to list what I’m seeing on the top bar. I’ve read good and bad things about the camera. It’s very easy to use and below was my first successful posting of a photo from my Droid to Facebook. My first attempt was to use the “Take a Photo” button on the Facebook application. This resulted in what looked like a thumbnail in my Mobile Uploads library. What I finally did was go into the Droid “Gallery”, find the photo and then share it with Facebook to get a reasonable size. Stay Tuned for more photo and video tests later this week. Making my first call was simple and as easy like it should be. The call quality was exceptional. When I received my first phone call it almost didn’t happen. I tried to touch the green phone on the screen but didn’t know I actually had to slide it to the right to answer. One cool thing that worked on Day One without any effort was importing friends into my Contact list from Facebook. This was a surprise and was kind of cool when I saw my wife’s Facebook profile photo appear on my phone when she called. As far as a phone goes the GPS is brilliant but still needs a little work to compete with stand alone devices. I took one short trip around town using the GPS along side my Garmin Nuvi but it probably isn’t a fair comparison. It didn’t help that the Droid kept calling my street “Sunni-side” Road and not Sunnyside. I’m going to need a little more time to fully evaluate this feature. Tomorrow I’ll be spending some time in a hospital waiting room so I should have plenty of time to explore more. Stay Tuned for My Droid Day Two. I'm pleased this month I have a special prize I can hopefully give away to one of my readers. 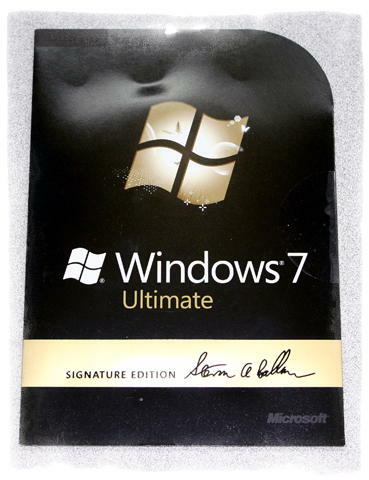 While attending the Windows 7 NYC Launch Party I received a copy of Windows 7 Ultimate with Microsoft CEO Steve Balmer’s signature. I already have Windows 7 so I wanted to share this version with someone special. Since this month WinPatrol will be 12 years old I thought it was be a great time to celebrate WinPatrol's Anniversary by giving away some valuable prizes. Tell your friends about WinPatrol and win! The first version of WinPatrol was released on November 19th, 1997 so this month Scotty will be celebrating his 12th birthday. To show his appreciation to all the PLUS members who have spread the word Scotty wants to share some of his favorite toys. If you have helped a friend or family member by having them adopt Scotty you can register to win. If not, you have until November 19th tell your friends to get on board and become a WinPatrol supporter. Your chance to win is 1 in 10. For every 10 entries in the contest, a 1 GB WinPatrolToGo USB Wristband will be added to the prizes! A minimum of five wristbands will be awarded. The partner of whoever wins the Grand Prize will also receive a 1 GB WinPatrolToGo wristband.